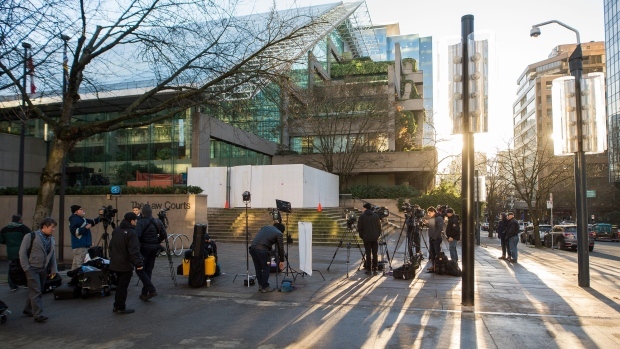 Huawei Technologies Co. Chief Financial Officer Meng Wanzhou was charged with conspiracy to defraud banks and should not be granted bail because she may flee, a lawyer representing Canada said during a court hearing on Friday. The U.S. alleges that Huawei used a firm called Skycom to do business with Iran, breaching sanctions, and that Meng hid ties between Huawei and Skycom, according to Crown attorney John Gibb-Carsley. Canada was presenting the case against Meng on behalf of the U.S., which wants to extradite her. The Crown attorney argued against granting Meng bail because she’s so wealthy that she will easily be able to pay whatever is required and then flee. Since learning of the investigation into her alleged activities, Meng has avoided the U.S. and other Huawei executives have stopped traveling to the U.S., he added. "To feel the pull of bail, we are in a different universe in this case," he added. Banking institutions were induced into transactions that violated sanction laws and exposed them to risk of fines, he also said. The attorney didn’t name the banks. Meng’s defense lawyer David Martin said the evidence presented doesn’t prove she broke either U.S. or Canadian law. U.S. sanctions law is very complex, has changed over time, and there are exemptions for telecom equipment in the country’s Iran sanctions, Martin argued. Meng was arrested in Vancouver Dec. 1 at the behest of U.S. authorities for allegedly violating American sanctions on selling technology to Iran. She was flying from Hong Kong to Mexico with a stop in the Canadian city. Meng spends two weeks a year in Vancouver, her family owns properties in the area, and she has a 16-year old son at school in Boston. Martin, her lawyer, said she would never breach a court order on bail because that would embarrass her father and China. The case has roiled markets already hammered by months of rising trade tension between the world’s two largest economies. The move has especially enraged China, which called for her release. Meng is one of China’s most prominent businesswomen. She is the daughter of Ren Zhengfei, the founder of Huawei, a national champion at the forefront of President Xi Jinping’s efforts for China to be self-sufficient in strategic technologies. While the U.S. routinely asks allies to extradite drug lords, arms dealers and other criminals, detaining a major Chinese executive in this manner is unusual. The hearing in Vancouver is the start of a long legal process in Canada that could end with Meng being sent to the U.S. to stand trial. Even though the North American neighbors have a longstanding treaty governing extradition, it can take months, even years, for a defendant to be handed over, if at all.